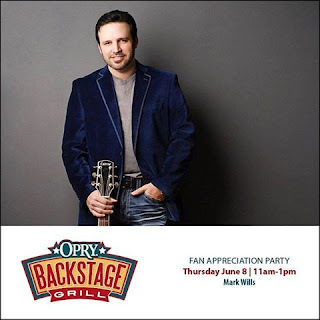 2017 Mark Wills Friends Club Party Announced! Mark Wills has announced that the 2017 Mark Wills Friends Club, fan appreciation party will be held at the Opry Backstage Grill on Thursday, June 8, 2017 from 11 am to 1 pm during CMA Music Festival week! This is a free, non-ticketed event and admission will be on a first come, first served basis! Purchase of lunch is required. Mark always has an amazing party! Get there early to ensure entry!